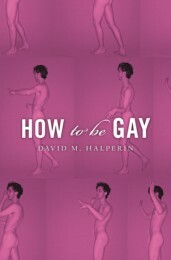 David Halperin’s gargantuan tome, How to be Gay, comes upon the heels of the controversy surrounding his undergraduate course of the same title. Although Halperin is an eminent scholar in queer studies, this text, which comes in at 457 pages, with an additional 68 pages of endnotes, is not the how-to guide one might anticipate given its title. Although he claims the impetus for the project springs out of an interest in gay initiation, he spends the bulk of the text explicating the generic conventions of gay identifications from pre-Stonewall popular culture to the present. He does this in an attempt to understand why members of gay male culture prefer feminine gender identifications and the queering of straight culture over the privileged identity markers of a liberated, virile, and natural gayness. He writes: “Now that gay men were living their homosexuality not as a cultural practice but as a sexual identity, they required a new gender style; and the masculine gender style that they adopted…excluded the feminine identifications that had informed and defined much of traditional gay male culture” (50). For Halperin, there is a “distinctively gay way of being…[which] appears to be rooted in a particular queer way of feeling. And that queer way of feeling—that queer subjectivity—expresses itself through a peculiar, dissident way of relating to cultural objects…and cultural forms in general” (12; original emphasis). In short, he sets out to examine male homosexuality as a cultural orientation, one that he claims is not, in fact, the sole province of gay men; indeed, writing at one point, Halperin opines, “Sometimes I think homosexuality is wasted on gay people” (448). Surprisingly, Halperin avoids engaging prominent queer theorists, like Lee Edelman or Eve Kosofsky Sedgwick, who for him, draw too much from psychoanalytic discourses in their work. The queer subjectivity that Halperin seeks to uncover is not the subjectivity “which can be safely theorized in the register of psychoanalytic abstraction” because according to Halperin, “psychoanalysis…is not useful for understanding the collective subjectivity of specific social groups” (89). Halperin’s attempt at disavowing psychoanalysis is refreshing, to say the least. In its place, Halperin attempts “a close reading of cultural objects” (89) to tease out the poetic or generic conventions of gay male culture. His study focuses “above all on social and cultural forms in their positivity, as autonomous objects of description and interpretation, and will not reduce them to mere expressions or products of social process” (137; original emphasis). Nonetheless, Halperin is unable to fully exorcise the legacy of psychoanalysis given his own investment in lauding gay subjectivity and its identifications over gay identity. Halperin insists that his object of study is neither gay desire nor gay identity, but rather gay subjectivity and the identifications that accompany it. As I alluded to earlier, Halperin insists that understanding gayness as sexual identity and not a cultural practice delimits the myriad affects and dispositions that circulate within it. Simply put: “gay male desire cannot be reduced to gay identity, to gayness as identity. Gay identity is therefore not adequate to the expression of gay subjectivity” (90). Halperin is adamant that examining gay identity is antithetical to his project because the “politicized and sexualized gay identity” that was supposed to replace traditional, feminine gay cultural forms has not replaced the queering of straight culture as the dominant cultural mode (120). Halperin argues that codifying gay identity is limiting, citing the pervasive effect that this strategy has had in popular film, television and literature, where identification is almost entirely restricted to a poisonous choice between the “Will Truman” or the “Jack McFarland” archetypes, leaving all other identifications off-limits. The gay fascination with queering and identification that Halperin insists upon is compelling for him above all from the vantage point of gay children, who grow up in a straight world, overly invested in fantastical figurations of what could be (229); as such, “gay male culture still operates through—and indeed thrives on—a metaphorical or figural reading of straight culture” (122). Whereas gay identity demarcates boundaries, gay identification deconstructs those boundaries: identification allows for “the feeling of closeness to, or affinity with, other people—with anything and everything that is not oneself” (122). While such a reading of identification is not without its problems—suggesting an internalized homophobia by not wanting to be oneself—it also illustrates that not only is gay male culture highly figurative and imaginative, but also that this obsession with identification breeds a less bigoted attitude towards difference at an early age. The second analytical trajectory that Halperin takes involves decoding the genre conventions or poetic forms of gay male culture since, for Halperin, genres “produce regularities in social behaviour and discursive practice throughout a wide range of human interactions” (132). He parses out and analyzes the conventions essential to the gay male genre as such: the collapse of the distinction “between tragedy and comedy, specifically the practice of laughing at situations that are horrifying or tragic” (159), the melding of feminine glamour and feminine abjection (159), the embrace of stigma (181), and the disavowal of the serious (186). For Halperin, straight culture is “earnest, judgmental, sententious, moralistic, therapeutic, literal” (176). Whereas gay male culture, due to its investment in identification and the feminine, lauds performance and the figural; in short, he regards gay male culture as a re-stylization of the mundane, banal straight world. A quarter of the way into the book, Halperin poses one of his more salient questions: “we might wonder what gay identification does for us that gay identity cannot do” (123; original emphasis). Rather than concern himself with contemporary identifications, Halperin examines aspects of so-called classic gay male culture, principally, the stereotypically effeminate aspects: Broadway musicals, male opera singers, and Joan Crawford films, etc. Throughout the remainder of the book, Halperin critiques the circulation of Joan Crawford as a representation of a glamorous, albeit abject femininity, a figure whom many white, American gay men have long identified with. A product of my generation, my own familiarity with Crawford’s oeuvre is minimal, but Halperin’s hermeneutics is transferable to other examples—which is both commendable and disappointing since he uses transferability as an excuse to escape expanding his archive (354). Even in his engagement with Crawford, Halperin restricts himself to a few examples. Halperin fixates upon her role in the film Mildred Pierce and the biopic Mommie Dearest to illustrate how the denial of serious affect is always already present within female cross-generational “tragedies” since they always appear merely melodramatic (261). The scenes which Halperin dissects at length revolve around mother-daughter conflicts, with a mother figure, in one instance Crawford-as-actress and in the latter an actress-as-Crawford, demanding respect from a defiant and unloving daughter. It is because these scenes contrast Crawford’s “austere elegance and dignified bearing…with the abuse she suffers and the social and emotional mortification her face so eloquently registers” (158) that Halperin believes gay male culture affiliates itself with these camp representations. In other words, gay men are able to identify with Crawford because they, too, wish to rise above their own effeminate abject status and lead glamorous lives. Some of Halperin’s most astute analyses lie in his engagement with both seriousness and irony, though. According to Halperin, it is only by making a performance of seriousness (283) and by not taking serious affects too seriously that gay men can give public expression to their private feelings. He specifically refers to a group of men known as the “Fire Island Widows” who parodied Italian widows and their mourning rituals in order to find a space to grieve for their friends and lovers who died of AIDS at a time when gay men where not afforded a public forum to grieve those deaths (181). Parody and irony, here, provide gay men an avenue to express serious emotions in a manner most would consider unserious and disrespectful. Despite the intellectual rigor and merit of the above arguments, Halperin’s book is not without its problems. First, for a book that is over four hundred pages in length, Halperin could have had a more inclusive, diverse, and less universalizing archive. Moreover, given his own participation in gay male culture, Halperin is, on more than one occasion, far too anecdotal. For instance, he deconstructs a pamphlet he found in his locker at a gay gym (368-374). I understand Halperin’s desire to read the ephemera of everyday gay existence, but his argument that the pamphlet intentionally participates in the initiation of gay men into gay male culture by quoting “Ritorna vincitor!” from Aida is unconvincing. His suggestion that “multiple ironies produced by invoking opera in the context of a sporting event impart to the members of the gym a shared consciousness of being part of a specifically gay collectivity” (374) reads as utopian and circumvents ignorance and indifference as possible—perhaps the most likely—responses to such a pamphlet. His comment gestures towards race while concomitantly dismissing it. Halperin neither provides nor considers even the possibility of a racialized counterpoint to Joan Crawford; I wonder to what extent someone such as Eartha Kitt or Oprah Winfrey could complicate and nuance Halperin’s argument. He acknowledges the Fire Island Widows’ appropriation of Italian mourning practices, but he does not consider representations of non-White femininities that mix the abject and the glamorous. To be fair, I do not imagine that, prior to the civil rights movement, on the whole, non-White actors achieved the level of fame that Crawford did with mainstream audiences, and, as such, the pool from which to draw non-White gay icons is, at best, highly limited. But would there not be more examples in the contemporary era? It is at this critical juncture that Halperin’s book becomes as antiquated as the Joan Crawford films he examines. Although he does illustrate how key moments from her films continue to pop up in unexpected queer places, most of those references are lost on younger generations. In the same way that one cannot claim Shakespeare is representative of all English literature, one cannot claim Crawford is representative of gay male culture and its practices. As much as I laud him for examining gay femininity and effeminacy, his book seems to be performing the work of an earlier early gay studies—not even early gay and lesbian studies—that did not go beyond the figure of the white, middle-class, gay male as its object of study. Missing from his analysis is the positioning of his archive and methodology within current queer theoretical debates. While he clearly disavows a dependence upon psychoanalysis, he does not sufficiently engage any current work in queer theory that could contextualize his argument. Moreover, his book lacks the critical terminology necessary to be on par with queer theory—absent from his book, both in the index and throughout the text itself, is an acknowledgement and engagement with homonormativity, a crucial concept in queer theory. While he writes that, “Just as you can participate in gay culture without being homosexual, so you can participate in heteronormativity without being straight” (451), the absence of “homonormativity,” as such, as a point of analysis suggests that Halperin is not up to date with current debates in queer theory. Given his investment in queer appropriations of heteronormative popular culture, and his argument that representations of gay identity fail to take hold, one would assume that he would trace out the nuances of homonormativity. The book does not fail to provide an interesting and engaging critique and description of some gay male cultural practices, but with four hundred pages to work with, it is possible to engage a diverse archive, avoid repetition, and the universalizing of one set of genre conventions. Andrew Buzny is a doctoral candidate in the Department of English and Film Studies at the University of Alberta. His dissertation examines the intersection of queer theory and forgiveness in twentieth-century American culture.